This is an attractive example of Adam and Charles Black's 1844 map of the Netherlands, now divided into Holland and Belgium. 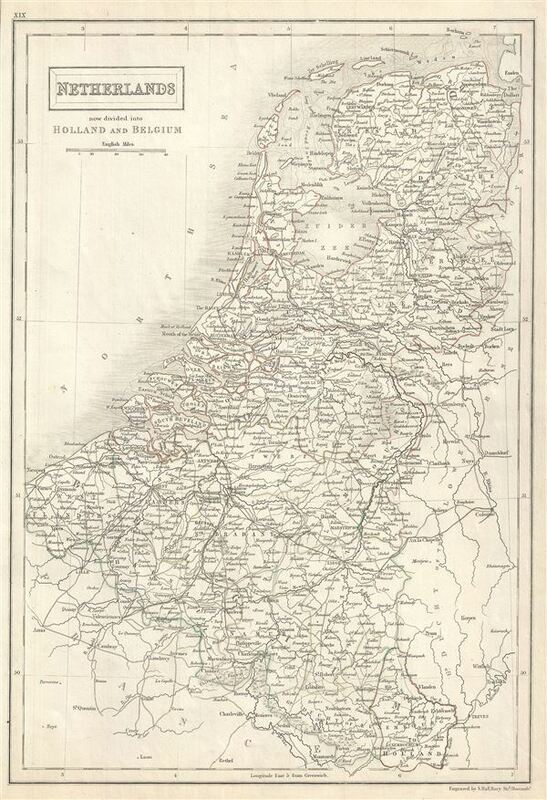 The map covers both Holland and Belgium from Friesland to Luxembourg. The Grande Thierache or the 'Thierache Forest' in southern Belgium and 'The Peel' in southeast Holland are beautifully rendered. Throughout, the map identifies various cities, towns, rivers, lakes, roadways, railways, islands and an assortment of additional topographical details. In 1830, after the Belgian Revolution led to the secession of Belgium from the United Kingdom of Netherlands into the independent Kingdom of Belgium, Luxembourg, which also took part in the Belgian Revolution, was considered to be a province of the new Belgian state. The Netherlands however, refused to recognize the new country of Belgium until the 1839 Treaty of London. The Grand Duchy of Luxemburg, elevated from its previous status of Duchy by the Congress of Vienna in 1815, was divided with the independence of Belgium. A large western portion of the Grand Duchy was ceded to Belgium as a province, leaving a much smaller eastern portion. Luxembourg, during this period, suffered economic hardships which led to many of its citizens immigrating to the United States. The Second Treaty of London, following the Luxembourg Crisis finally reaffirmed Luxembourg's independence in 1867. This map was engraved by Sidney Hall and issued as plate no. XIX for the 1844 edition of Black's General Atlas.